AO included a "Dad's Track" this year, and I was very proud to be a part of it. The day ended with a panel discussion. Here's a presentation from this past Autism One/Generation Rescue Conference, featuring good advice from Thomas Clark. This may be one of the most important things you can watch. 'Nuff said. We are the people who won't go away. We ask the questions that haven't been answered, and that won't be swept under the rug. And whenever it becomes apparent that we--and our pesky questions--are still hanging around, the people who would shout us down and/or label us with snide names ("anti-vaccine," "mercury militia," wackos," etc.) ramp it up a notch. They are no longer content to hint at their real message: that the collateral damage of hundreds of thousands of injured children is an acceptable sacrifice for the "greater good" of an out-of-control vaccine program. Those who place an unquestioning belief in that program--a belief built more on taught lore than on actual scientific study--have realized that the questions and the questioners remain. So now the almost predictable and thinly veiled cries have arisen that our words should not even be heard. That the concept of censorship is so comfortably proposed by seemingly main stream people is of profound concern to me. It seems that those who support the vaccine program have convinced themselves that the program is above discussion and public discourse. Vaccines are all good and unquestionably safe. Those who make them, administer them and supply them are all beyond reproach. Bringing up the radioactive ‘autism’ thing really throws them into a tizzy. Not only is discussion of vaccines and autism found to be against “scientific consensus” but it is now supposed to be described as a “fringe theory.” If you talk about this issue, you are a member of a lunatic fringe. You are out there in the woods, looking for Bigfoot. The entire post, entitled "The Death of Public Discourse and the Heavy Snow of Plausibility" is a must read. Go here to do so. Almost 21 months ago, we addressed an open letter to the Chicago Tribune, making it clear just why we felt it necessary to cancel our subscription. Today, I'm more disgusted than ever at what I used to think was a great paper. So I thought I'd revisit the letter. A few days ago, we called the circulation department to cancel our subscription to The Chicago Tribune. We thought it appropriate to write and explain why we thought this necessary. Put briefly, the Tribune’s continuing written assault on the autism community and those who serve us has caused us to lose the high degree of respect we once held for your newspaper. Specifically, articles written (or co-written) by Trine Tsouderos have, in our opinion, strayed from the principles of balance, fairness, and the truth. By way of background explanation, our family is one of the hundreds of thousands in this country who have felt the impact of the autism epidemic. We are part of a growing number of people who have chosen not to meekly embrace our son’s disability, but rather to seek biological explanations for the clinical manifestations that led to the diagnosis and to utilize the best medical treatments to treat the underlying physical conditions. We are not alone on this journey, and like most of the parents who embark on this course, we are well-educated. Both of us have professional backgrounds (including a background in mainstream medicine). Each case of autistic spectrum disorder is unique from a standpoint of both cause and treatment. We have utilized some so-called “alternative” therapies together with more traditional treatments. The continued improvement of our son’s clinical manifestations has been nothing short of remarkable. Our story is not unique; there are many of us who have seen first-hand the success that can result from treating underlying physical conditions instead of just the symptoms by which autism traditionally has been defined. I did a rather long interview with the Tribune to explain my thoughts on chelation and additional approaches to solving the health issues connected to autism. The only consequence of my interview is that you use a solitary quote to make me sound contentious and defensive. Is there a reason you chose not to use something I said that would actually illuminate the discussion surrounding chelation and other medical treatments for medical compromises that may exist in these children? To be sure, this is a complex and often controversial subject. The Tribune’s editorial stance on autism treatments, however, seems inconsistent with other positions it has taken. Recently, your paper printed an exposé on overuse of drugs at nursing homes, a worthwhile subject. Why is the only focus of your autism coverage upon so-called “alternative” treatments? Why is no attention paid to the frighteningly large number of physicians who want to treat autistic children under the age of five with dangerous stimulants and psychiatric pharmaceuticals? And why does the Tribune not show outrage at the fact that the American Academy of Pediatrics endorses that off-label usage of pharmaceuticals in their published treatment recommendations for autism? The Tribune has run recent articles on rising numbers of allergies (including one noting the difficulties the Army is having in filling its ranks due to high incidences of allergies and asthma). Is your paper at all interested in exploring the interrelationship in the alarming rise of various auto-immune disorders: childhood cancer, asthma, allergies, ADHD and autism spectrum disorders (although not unanimous, more and more scientists are acknowledging that disorders in the immune system can cause clinical manifestations of autism)? Our kids are the canaries in the coal mine. Something is going wrong with an entire generation, and it is rooted in environmental causes: adulteration of our food supply, chemical pollution, contamination of our water, overuse of antibiotics, and quite possibly a public vaccination schedule gone haywire. It’s not just scientific research that’s needed to put these puzzle pieces together; we also need the illumination of the questions in order to solving the questions a public priority. The role of the press is to present the issues in such a manner as to fairly raise the questions. In that, the Tribune has fallen well short of its duty. The articles by Ms. Tsouderos were given front-page treatment, including the latest, which came at a time when every other organ of the press was focused squarely on the recent tragedy in Haiti. The lack of proportionality in that is summed up in one question. Why did the Tribune not show equal alarm with a major front-page article last month, when the Centers for Disease Control announced new autism statistics? According to the CDC, autism spectrum disorders effect one-in-110 children (one-in–70 boys), which is a dramatic increase from the one-in 150 the CDC announced just two years ago. This country is facing a public-health crisis of catastrophic proportions, in which too many families are having to make difficult decisions. Instead of amplifying the seriousness of the situation, the Tribune has chosen to blindly criticize some of the scientists and clinicians who are searching for the answers. We have no doubt that the loss of our subscription will have little economic impact on your company. Further, the publication of the articles in question will have little adverse impact on the Tribune’s reputation – at least not immediately. What the Tribune has lost, however, is far more precious. It has lost the integrity upon which the paper’s reputation was built through generations. This has been the season of nail-biting for my wife and me. After years of steady progress in elementary school, the Little Rankster went into Middle School this year. He’s now learning to deal with the constant changing of classrooms, dealing with the locker, changing for P.E., etc. It’s a lot of change to throw at any kid—especially one on the spectrum. The biggest change has been that he now rides the school bus. It’s not the “special” bus; it’s the “regular” bus with all of the neurotypical kids. And that’s a bit scary for us as parents. We’ve tried to use it as an opportunity for fostering more independence. We only walk with him for about a third of the two-block walk to the bus stop. But it’s so difficult sometimes to let go. Dad: You don’t mind if I walk all the way with you, do you? LR: Actually, I’ll just kiss you good-bye here. Dad: Okay. But then I’ll walk you all the way. LR: Actually, Dad, you’ll just walk me half-way. 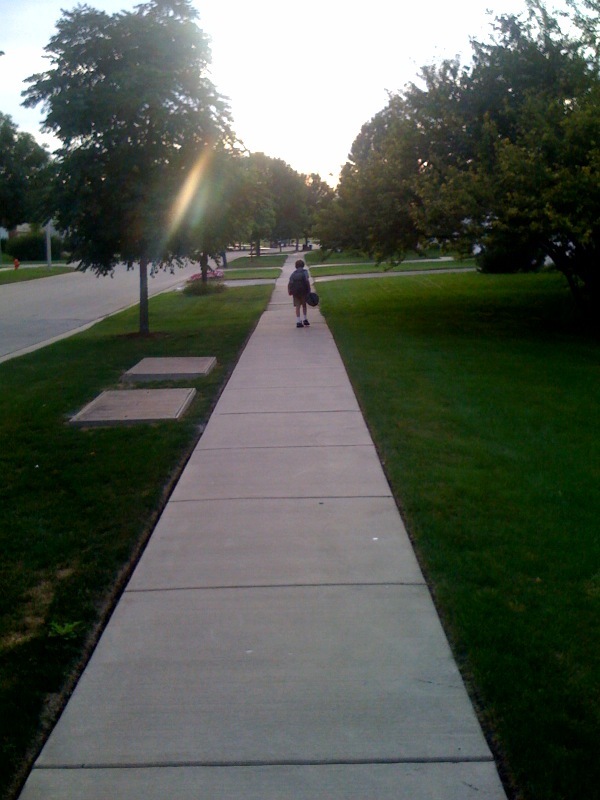 As I watched him walk, weighed down by his backpack and his trombone, I thought back over the journey thus far. I remembered the conversation when the developmental pediatrician gave us the Little Rankster’s diagnosis. He had three pieces of advice. The first two items were to put him on Ritalin (a recommendation for off-label use, by the way), and to immediately put him in a “special” school where they would know how to “best deal with his problem.” The third piece of advice was to get on the waiting list for an institution, because the likelihood was that he would never speak or be able to function in a mainstream environment. I was in shock, but my wife was energized into action. And her reaction saved my son. So here we are now, with a boy who attends school in a mainstream environment without an aide. He plays—and even excels—in the school band. In Elementary School, he sang in the chorus, and served on the student council. To be sure, there are still struggles and issues, and we’re not finished yet. But the progress borders on the miraculous. It didn’t just happen. There’s been a lot of work. There has been lots of biomedical intervention and assorted “voodoo.” There have been weekly visits to speech therapists, and summer programs to work on one thing or the other. There was a move from our beloved home to another state to have better access to services, and to be closer to a remarkable physician who has had an immeasurable impact on our family. Through it all, there has been one person who’s worked at it harder than my wife and me. And as I watched that person walk to his bus stop, I came to a realization. Sometimes a one-block walk can be a hell of a long journey. I took a month off from my Autism One Radio duties in July (resulting in a rerun of one of the more memorable prior episodes). This month, though, we’re back in a big way. Tomorrow (August 28, 2011) at 1:00 pm Eastern/Noon Central, we’ll have a very special Injecting Sense: The Radio Edition. I have two guests for you, both of whom are shining examples of taking positive action. First, I’ll be talking to Marcella Piper-Terry about the new-but-growing-at-a-rapid-pace billboard campaign to educate parents about their right to decline vaccinations for their children. Then, we’ll take some time to talk to Harry Tembenis about how he and his wife were inspired to take positive action by their son, Elias. I guarantee you will be inspired. Join us on-line at Autism One Radio. Or, as always, you can catch it later in the archive. All the time. They’re everywhere. A couple of weeks ago, we made one of our pilgrimages to bow before the mouse with the white gloves. The Rankin family is Disneyfied. Every few years (or more often if we’re able), we have to pack the car and head to Lake Buena Vista, Florida, home of the happiest place on Earth. We not only have a great time (all the wishes you can afford), but we get to look through a window onto America. On this latest trip, I made two observations about the state of our people, and those observations are not terribly positive. One is about how people treat each other; the other is about how they have been treated. First, the decline in courtesy and civility in our society continues to amaze me. You have to understand; I’m old school. I was raised to believe that the fabric of our people is held together by the display of good manners. When I see adult men keeping their seat on monorails and busses when there are women and children standing, I am disgusted. I saw a few men do the right thing, but often it was out of a sense of shame after seeing someone like me do it. I was encouraged by one teenager who spontaneously get up and offer his seat to my wife and son. More often than not, though, I saw men in their twenties and thirties keep their seats and look down to pretend they didn’t see anyone else. Another indication of the decline of cavity is one of my pet peeves: men wearing hats (usually baseball caps) in restaurants. Yes, I realize we were in a resort area, and that the old rules are relaxed. I can handle guys wearing shorts and decent t-shirts to nice restaurants. I can handle wearing caps inside the lobby of a hotel, inside souvenir shops, or even in elevators. But I always like to think of restaurants and dining rooms as the last refuge of civility. This is not something restricted to Disney World. I see this absurd and disrespectful wearing of headgear in nice restaurants outside of resort areas. These aren’t guys wearing hats outside and not wanting to show their hat hair; most of the guys I saw doing it were bald or had buzz cuts. And it’s not just kids. I see middle-aged men doing it. Shame on their parents for not raising them right! Okay, let me get off of that soapbox. My second observation is far more serious. A day or two into our visit, my wife turned to me and asked, “have you noticed how many more scooters we’re seeing than we used to?” Some were the people we’ve always seen: the elderly, those with heart problems, those with extreme arthritis (a bad enough sign of the times). Mostly, though, we saw people who needed their scooters because they were just too heavy to ambulate on their own. Don’t get me wrong. I’m carrying too many pounds on my frame (a situation I’m addressing). I’m not talking here about people who are “husky,” “heavy-set,” “big-boned,” “chubby,” or even just “fat. The people we saw on their scooters fit the category of morbidly obese. And they were everywhere. They tooled around here and there, but even in one of the most ADA-compliant locations on the planet there were things they just couldn’t do. It was just too hard for them to maneuver through the crowds—not that it didn’t stop them from trying as the screams and howls of folks with run-over feet attested. The level of obesity we see these days is not just a problem of too many people lacking discipline at the dinner table or spending too much time at the television. And even though we saw entire families that were way overweight, this isn’t a simple matter of genetics (there may be some genetic predisposition at work, but it’s too simple an answer). This is not a matter of personal behavior as much as it is a matter of environment. The obesity epidemic is just one more part of the “new normal.” We’re a society packed with autoimmune disorders, developmental disabilities, and so many chronic health problems—like obesity. Is it all related? The causes for all of these things are complex. Even the autism epidemic can’t be limited to just over-vaccination and vaccine toxicity. The root of the obesity epidemic are the most basic parts of the underlying causal factors of the “new normal: as a whole. It all comes down to what we are putting into our bodies. We live in a country in which the advertising empires have convinced us we must eat “low-fat” foods, and use artificial ingredients to avoid all of that bad natural stuff that will make us fat. So how come we’re going in the other direction? Could it be that we shouldn’t be so focused on how much fat as we should the kind of fats? Could it be that we shouldn’t be so focused on saving calories that we wind up putting pesticides in our bodies instead of real, raw sugar, honey, or natural alternatives? Do we need to focus so much on food production that we feed things to cattle that God didn’t design their systems for, genetically design seeds to put the pest control inside of the food instead of outside (both bad alternatives), or poison the waters from which we get so much of our sustainable food supply? Our family made a commitment some years ago to clean up our diet. We eat grass-fed beef, wild caught seafood species that are known to not retain mercury, pastured pork and free-range chicken, and organic produce. It’s made a difference in our lives. We feel better. We’re healthier. And on those occasions when overconsumption and inactivity bring on the extra pounds, we’re able to make relatively easy corrections that don’t involve riding on electronic devices. A good place to start is the Weston A. Price Foundation. It’s that time again: time for my monthly assault on the web-waves. June’s installment of Injecting Sense: The Radio Edition will come your way on June 28th, at 1:00 pm EDT. 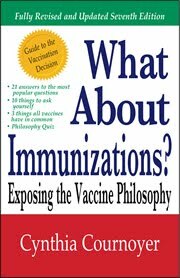 My guest will be Cynthia Cournoyer, author of What About Immunizations? : Exposing the Vaccine Philosophy. It’s a great read, discussing how vaccine interests have misframed the debate. You can hear it here on the 28th. Or catch it later at your convenience when it hits the archive. This year’s Autism One/Generation Rescue Conference was filled with the usual opportunities for education and fellowship, and the annual attempt by a certain someone to show up for the sole purpose of being asked to leave (he wasn’t disappointed). And as often happens, the conference provided the stage for a special announcement. 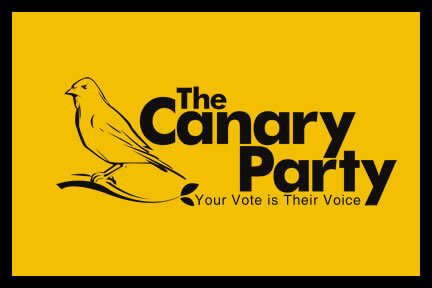 On Friday, May 27th, the Age of Autism trio (Mark Blaxill, Dan Olmsted, and Kim Stagliano), along with my pal, Ginger Taylor, invited all to join with them in the Canary Party. Judging by the reaction within the packed room, it is an idea whose time has come. Although it will have some of the trappings, this is not a party in the traditional sense of the world. It is, rather, a political movement. It’s a movement to use political means to bring honesty to the scientific endeavors of our nation’s public health sector. It’s a movement to use political means to bring fairness to the legal system. It’s a movement to steer our nation’s political leaders toward asking tough questions. It’s a movement that embraces all sides of the political spectrum: left, right, liberal conservative, and all other descriptions that have lost all of their traditional meanings in the mess of partisan politics. Some, who are nonetheless enthusiastic about the mission, expressed some concern over the name of the party. The name, of course, comes from the old use of canaries in coal mines to warn miners of dangerous toxins. What I heard from some was “aren’t the canaries the ones who die?” Yes they are. And they do. Too many of our kids’ lives are cut short. The fact is that the children of the autism epidemic are the canaries in the coal mine. They are the outward and visible sign of a much broader public health crisis; this is not just about autism spectrum disorders. Anyone who has worked in health care for 20 years or more—at least any that are willing to honestly answer—will tell you that the growth of all autoimmune problems in younger populations is alarming. And the causes for this public health crisis include, but are by no means limited to a vaccine program that has run amok. Those causes include pollutants in the air, water, and soil. They include the adulteration of our food supply. They include the indiscriminate use of pharmaceutical products. And all of those toxic insults have occurred with the cooperation of various federal regulatory agencies that were charged with protecting the public. Political pressure must be brought to bear on a regulatory system that has become nothing more than a career path for bureaucrats who want subsequent jobs in the various industries we pay them to protect us from. Reaction from the “other side” has been predictable. One self-styled “skeptic,” a medical blogger with no child to worry about, dismissed us by commenting that the color adopted by the party reminds him more of a certain bodily fluid than it does canaries. Wow, that was profound. To him, and to those of like mind who would rather treat us with scorn and derision rather than debate us with intelligence, we have a message: bring it on. This is the right movement the right time. Concern for the future health of our population is steadily increasing, and our numbers will increase with that concern. The only ones that can stop us are ourselves. We have a history in our community of letting internal politics tear us apart. That cannot happen with this endeavor. That’s why it was so important that this announcement came at a conference with a history of bringing together a wide range of groups who can coexist. If we’re going to make this thing work, we need to check our egos at the door. We have to worry less about who is speaking and acting within our ranks, and worry more about who is doing what to the most vulnerable people. We must keep our eyes on the prize. There can be only one agenda: our children. Our children have been endangered canaries for too long. It’s time to clean up the mines, and let them fly. Join us. I wouldn't be able to say "happy Mother's Day" any better than I did a couple of years ago when I posted this. Today is Easter Sunday. This morning, I started thinking back to years past when my mother, Betty “Big Mama” Rankin, hosted the Moldy Fig Jam every Saturday morning on WWOZ radio. She showcased the best of traditional New Orleans jazz, and did so with love. On the day before Easter, she always threw in a heaping helping of hymns played in the New Orleans style, and she saved a little time to play some Mahalia Jackson. For Big Mama, it made sense to pay tribute to the Lord by sharing one of the most glorious voices He ever created—a native voice that bridged the gap between the sacred and the secular souls. Playing Mahalia also educated the listeners as to the roots of the jazz they so loved. So every year Big Mama played some Mahalia, and every year, like clockwork, some ignorant jerk would call the station and complain. Typically, the faceless voice on the phone would declare that if he wanted to hear that $&@ gospel ! *%#, he would tune in the next day to hear the gospel show; he wanted to hear real jazz. Big Mama was not the kind of person who could easily shrug off the meaness of others. She always left the studio in tears. But within hours her tears of sadness would turn to … well, not exactly anger; I’d call it determination. She’d immediately start planning out her Easter show for the next year. And there would be one more Mahalia Jackson song than she played that year. I learned a lot from my mother. IS THE MEDIA FINALLY CATCHING ON TO THIS GUY? For years, I’ve had a love-hate thing for Dr. Paul Offit. As a blogger, I loved the fact that he always seemed to come to my rescue when I couldn’t find anything to write about. As if on-cue, Dr. O would say something outrageous and a blog post would practically write itself. On the other hand, as a parent, I grew so weary of what I perceived to be his arrogance and cavalier attitude toward the victims of the autism epidemic. Beyond all else, though, I have constantly wondered why the mainstream media kept buying the bill of goods this disingenuous salesman was pushing. Now it seems that someone is catching on. Better late than never. It will be interesting to see if anyone else in the mainstream media takes note. For Ginger’s take, and a peek at the CBS story that led to all this, go here. HERE’S SOME “AWARENESS” FOR YOU. IT’S GONNA COST SOMETHING. So here we are again: that time of year when everyone talks about “autism awareness.” It too often means making useless gestures, like putting in a blue light bulb. Sometimes though, it takes the form of a good, two-way discussion with a good friend. I had such a discussion, albeit via electronic means, with an old and very valued friend. Let’s call him “Bob” (mainly because his name is Bob). It all started with one of those Hitler videos. You know the ones I’m talking about. They show up from time to time on You Tube. They all use the same footage from a movie, taking place in World War II, called The Downfall. Hitler is meeting with his military staff, and the staff breaks some bad news to the Fürher. That scene took on a whole new life when people with nothing better to do in their life started adding their own subtitles, placing the scene in different contexts (e.g., Hitler finds out Michael Jackson died and won’t be at his birthday party; Hitler gets banned from Wikipedia; etc.). A recent version (go here because embedding is disabled) places Hitler in the role of a school district’s special-ed coordinator, meeting with his staff to plan their role in an upcoming I.E.P. meeting. He starts discussing the program they will foist upon the unsuspecting family, and the staff breaks the news that the parents are demanding an outside placement to meet the child’s needs. Worse yet, some of the staff members appear to agree that the outside placement is necessary. It all sounds so familiar to far-too-many of us. Our children need particular help to truly receive a “free and appropriate public education,” as guaranteed by the Individuals with Disabilities Education Act (IDEA). But programs like that cost money, and so some districts instead try to throw kids into a one-size-fits-all program to partially address the needs of a lot of kids who sort of have the same needs. It seems like all they’re really trying to do is shut up parents for a while until it’s too late to do anything. I did what so many of us do when we see stuff like that; I posted it to my Facebook wall. And that led to a conversation with Bob, who is the kind of guy who knows that good friendships not only survive spirited debates, but thrive on them. Bob is a computer networking professional, who works with the special-ed folks in an area that takes its IDEA responsibilities very seriously. They apparently do some very innovative things to actually serve kids with special needs. From his perspective, Bob thought the video painted with too broad a brush. Like me, he was viewing the satire through the lens of personal experience. Based on conversations with parents from across the country, though, I have to say that my experience may be closer to the norm. That is not the fault of the professionals who work with our kids on a daily basis. Most of them want to see more done. Rather, the blame is shared between the federal government, the school districts who are responsible for carrying out IDEA, and most of all, the well-intentioned but poorly defined mandates that IDEA sets forth. I can certainly understand that viewing the Hitler/I.E.P. video, if taken on its face, can lead one to the conclusion that an invidious comparison is being drawn between special-ed coordinators and the personification of evil. On that level, it can be called unfair. I have yet to meet any district representative who doesn’t seem like a nice person. This video, though, resonates with me as an expression of frustration with a system that tends to drive a wedge between people that might otherwise form a useful partnership. IDEA is a product of the early stages of the explosion of developmental disabilities. Its noble purpose was to guarantee that kids with autism, ADHD, and other problems, could have the same opportunity to receive an appropriate education as any fully-abled child. After it became the law, though, the explosion hit. The resulting situation is very similar to that described by the special services fürher in the video. The federal government mandated services, without properly funding them. And the response is all-too-often taking the easiest path of throwing together in-district programs that are based on proven strategies but don’t carry though the intensity needed to be truly effective. That approach ignores the first word in IDEA: individuals. It pays lip service to the concept of “no child left behind,” but in fact, tries to sweep children along until they’re past the age of IDEA’s reach. Those kids never reach their potential; they never have a chance. Almost as bad, that forces more and more parents, fighting for their individual children, to institute “due process” proceedings, which sometimes lead to court suits. Very rarely do the children get appropriate services during that process, and the districts waste precious monetary resources in the litigation (and make no mistake about it, “due process” means litigation). To be sure, the opportunities and problems vary from district-to-district. One of the reasons we moved from Louisiana back in late 2006 was to find some place with a better school system. And we found that. But “better” doesn’t necessarily mean “good” or even “adequate.” Had all else been equal, we would have wound up in a place where, like Bob’s locale, the approach to special education is proactive and innovative. Other factors, including career opportunities and, more importantly, access to other medical and therapeutic services, dictated our move to where we are. My point—and as usual, I’ve taken my own sweet time to get there—is that this country needs to wake up. We are in the midst of a true epidemic. As our kids reach adulthood, without the necessary tools to live independently, more and more financial resources will be needed to support them (which doesn’t even begin to address the tragedy of the impact on them as human beings). We, as a country, need to make a serious investment in appropriate educational services. And if that means spending more to outsource services, so be it. Just as important, this country needs to take a real interest in the hard questions of just how we got here in the first place. Stopping this epidemic and dealing with its victims is going to take more than screwing in a blue light bulb and talking about the fact that there’s a lot of autistic kids out there. We need more than a Khumbaya moment. Autism awareness must lead to action. Civil comments are always welcome. These posts are my opinions, and should be deemed as nothing but my opinions. Nothing herein should be used or relied upon as advice of a medical, legal, or technical matter.